Maureen and I spent the first weekend of October in Pittsford, a suburb of Rochester, NY. We did the usual things that starry-eyed visitors do, going to a Wegman’s store, where the range and quality of merchandise in a giant super-market made me feel that I was still living in the nineteenth-century, and whose theatrical, carnival bustle evokes a less perilous Bartholomew Fair; ogling the wines in the sanctum sanctorum of the Century Liquor Store where, the price per bottle being frequently in the thousands of dollars, Maureen found it easy to covet those in the mere hundreds; and entering the wonderland of L.L.Bean, fretting how I would decide between the Sunwashed Canvas Shirts or the Premium Double L Polos and how, if I opted for the former, I would choose among the Bluestone, Sage, Baked Clay and Deep Loden, not to mention the Bay Blue, Port and Coffee Bean colours (Regular and Tall, short-sleeve and long). But the highlight of the weekend, apart from our hosts’ cooking and conversation, was an evening at the Rochester Philharmonic Orchestra. To be precise, it was not exactly the orchestral programme or playing, though both were excellent, but the talk, given before the performance by the Orchestra’s conductor, on the music we were about to hear. Christopher Seaman’s public persona is as engaging as one is likely to encounter, and the talk he gave on the works to be performed, by Elgar, Liszt and Tchaikovsky, was intelligent and witty, and dashingly illustrated through the musical examples he played on the piano. The Tchaikovsky work was the Fourth Symphony, and what he had to say about it turned my mind, as almost anything does, to thoughts about the garden. 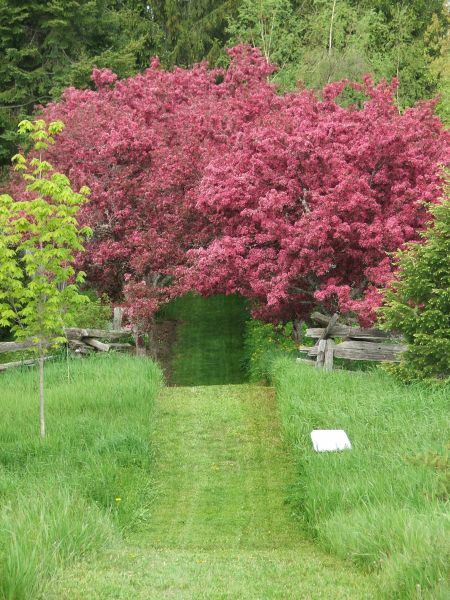 As you enter the 'Profusion' Allée from the east, the simple bench says that this is the last moment to enjoy the light before you are plunged into the darkness created by the double row of crabapples. Photo courtesy Brian Bixley. What Tchaikovsky found most difficult in composing, Mr. Seaman told us, were the transitions, the effort to make the work, or at least long passages within the work, seamless, so that even the musically sophisticated listener would not find herself distracted by the shift from theme to theme, from colour to colour, from mood to mood, from phrase to phrase. The concern with transitions in the garden, of how we move in a seamless way through a garden with many themes, colours and moods, goes back at least three centuries to Alexander Pope who thought transitions were the most difficult aspect of gardening. Because we have, in our own garden, fenced areas and hedged areas and radiating paths, straight mini-phallic paths** and paths of undulating tenderness, organically-shaped beds and narrow linear borders, there is a real danger of The Tchaikovsky Problem, of lots of tunes but no coherent, composite song. We want, as gardeners, to create a sense of excitement as we turn a corner, open a gate, move from sunlight into shadow but, if we are Classically inclined, we shall not want those shifts of colour, theme and mood to be discordant. If, on the other hand, we are Romantic or Modern, we may see those shifts, the evident seams, as just what is needed to get the blood racing, to renew the flagging interest, to produce the heart-stopping moments. Peter Ilitch may have believed he had a problem, one that Mr. Seaman identified, but perhaps it was precisely the absence of fluidity, the restless leap, that made Tchaikovsky one of the great Romantic composers, and whose example we can adopt and adapt in our gardens. The great Victorian economist Alfred Marshall inscribed his Principles of Economics with the dictum Natura non facit saltum, but perhaps as a prescription and not just a description it is a recipe for dullness. **”Lacan has taught us that the highway, la grande route, is the phallic signifier par excellence. ..it splits the landscape…It is also called a ‘drive’…The little paths found in gardens often come to a dead end, but one inevitably finds there a little glop of creative stuff, a shrine to the Virgin Mary, a fountain, an artful arrangement of stones.” Dean MacCannell, ‘Landscaping the Unconscious,’ in The Meaning of Gardens , ed. Mark Francis and Randolph T. Hester, Jr. (MIT Press, 1990). We have a number of glops. I too live in the boonies, although I grew up not far from where the Pittsford Wegman’s now stands. If it makes you feel any better, I remember when the site was a cornfield. Although I try not to shop at that particular Wegman’s (way to crowded/crazy), when I do find myself there, I think of the cornfields, full of straight, mini-phallic paths, and smile. The metaphor of garden design as musical composition is just awesome. 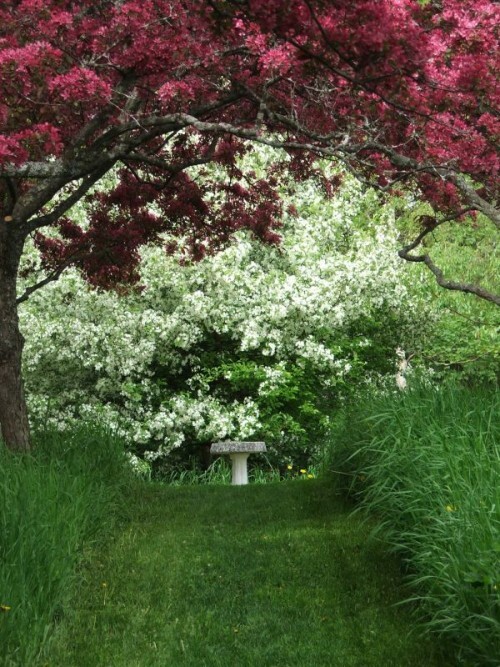 This has been one of the most enjoyable garden blogs that I have read all year. Goregous…I love the contrast of the split rail fence against the color of the crabapple and the texture of the grass. How simply elegant. Every phrase a work of art here. What happiness emanates from the Profusion Garden, those undulations, whatever meaning they convey, are the stuff of dreamland. What an interesting post! And I love the photos, especially the one with the birdbath. There’s a sense of something magical lurking just out of sight.